• La programación conjunta se materializa este año en cuatro conciertos los días 7 Y 8 from December, with the premiere in modern times historical recoveries six commissioned by the CNDM. 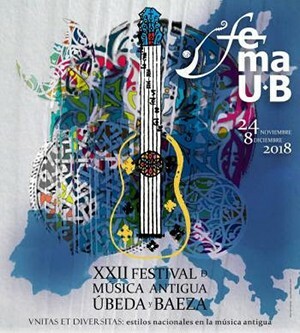 The National Broadcasting Music Center (CNDM) again co-producing the Early Music Festival of Ubeda and Baeza, collaboration that began with the creation of the National Center for eight years and which this year is materialized in four concerts scheduled the 7 Y 8 December in the two cities that give name to cycle. A) Yes, four leading specialized training in historical music, Basque Barrokensemble, La Bellemont, L'Apothèose and Recóndita Harmony, released in modern times six pieces whose recovery is a custom CNDM. According to the festival: “this special institutional collaboration, to which is added created National Radio of Spain, is fundamental to the success each year is our festival, because we support help bring early music to all audiences”. On Friday 7 December at 20:30h, in the Auditorium of San Francisco de Baeza, Euskal whole Barrokensemble directed by Enrike Solinís present The prophecy of the Sibyl, a program of religious music that tries to show the influence of pagan ritual in religious ritual that took place in the music of the Middle Ages and Renaissance. Su versión del Song of the Sibyl nos muestra el canto religioso a través de la voz de una cantaora, rescuing the centuries-old practice of presenting liturgical chants with attachment to the manners and musical traditions of each place. A few hours later, the stroke of midnight, The Bellemont play in the Chapel of the Old Seminary of San Felipe Neri, the same city, his approach to the language of the viola da gamba in the France of François Couperin, with works of this pillar of the music gala, which are met 350 years after his death, with pieces of contemporary composers. Already immersed in the weekend, The European tour continues to stop us this time in Spain, specifically in Madrid, con la agrupación L’Apothéose, Saturday 8 December at 17:30h, in the Auditorium of Santiago Hospital in Ubeda. Duron to Nebra. Operas and operettas in the eighteenth century Madrid trata la música escénica de José de Nebra como un hito dentro de la corriente modernizadora que vivió el Madrid de las primeras décadas del siglo XVIII. This concert is included in cycle # Nebra2.5.0 cross the CNDM is developing in nine Spanish cities to commemorate the 250 years after the death of the famous composer bilbilitano. To close this collaboration, el mismo 8 December at 20:30h en el Auditorio del Hospital de Santiago de Úbeda disfrutaremos de Recóndita Armonía Ensemble, set captained by Cuban violagambista Lixsania Fernández. For the occasion interpetarán Music of the Cathedral of Santiago de Cuba, selection of sacred music performed in the eighteenth century in that temple, with historical recoveries and Juan Esteban Salas Paris.